Recently a national fitness magazine put Cleveland on its countdown of fattest cities in America. And it also busted us as having an epidemic of binge drinking - so if you didn't hear this news in your local media, no wonder; newsroom staff is still hung over from Cinqo de Mayo. Or St. Patrick's Day. Or New Years Eve. Or Columbus Day. Or any day. But for those one or two of you still somewhat sober and interested in better-living-through-sustainability, the barnstorming eco-documentary VEGUCATED screens Thursday night, June 7, at 7 p.m., at the Big Dog Theater (2781 Euclid Hts. Blvd., Cleveland Hts.). Directed by comedian-actress-filmmaker Marisa Miller Wolfson. It follows a trio of average, meat-loving New Yorkers from different sections of Big Apple society as they take a challenge to forsake their indulgent carnivorous diets (and families) and go vegetarian-vegan for six weeks, eating healthy, in sort of an inversion of Morgan Spurlock's famous junk-food marathon in SUPERSIZE ME. In the process, the film also introduces prominent figures from the green-eating movement, such as a bodybuilder who restricts himself to a meatless diet yet still gets his protein, and Howard Lyman, the former beef cattleman who now evangelizes for animal rights and veganism. Yes, it is an advocacy piece, in the tradition of FORKS OVER KNIVES, PEACEABLE KINGDOM, FOOD INC. and other recent nonfiction features on the special-event circuit, trying to actually make this a better world (as opposed to one attempting to launch a new comic-superhero franchise). Expect reps from the area vegetarian-vegan and animal-rights subculture and Meetup groups to be present for the unreeling. Hopefully hot dogs and corned beef will not be snack options. Tickets at the door are $10. 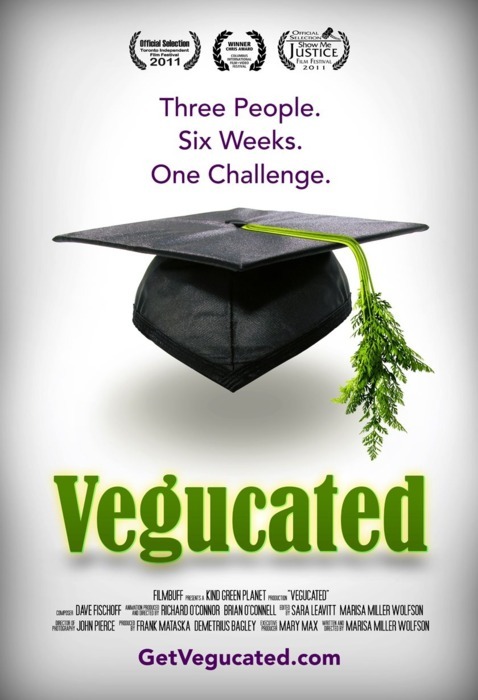 For more information go online to www.getvegucated.com or RSVP tinyurl.com/vegucatedCLE.